Could not find stored procedure “proc_UpdateStatisticsNVP”. This problem is caused by updating SharePoint 2010 to SP1. This update will try to execute this stored procedure, but it’s not there. If you go to location: “C:\Program Files\Common Files\Microsoft Shared\Web Server Extensions\14\TEMPLATE\SQL” you’ll see a file called “STOREUP.SQL”. This file will call this stored procedure. For one or another reason, the creation of the stored procedure fails when installing SP1. If you look at the file called “STORE.SQL”, you will see that there is a create statement for this stored procedure. Strange..
That’s all you have to do! Be sure that you execute this script on the right database. Use the drop down in SQL Management Studio, or start the script with “USE [DBName]”. When you want to install SharePoint (Foundation) 2010, the first thing you have to do is install the prerequisites required to successfully complete your installation and run SharePoint. One of the annoying things about the prerequisite installation procedure is the fact that your machine does need internet access. In many cases, that’s no problem. But there are some cases where it’s impossible (due company/network restrictions) to have internet access on the machine where you want to install SharePoint. The first step is to download SharePoint 2010 using an internet connected machine. You can download this using your MSDN subscription or using this link (for SharePoint Foundation 2010). Once your download is finished, go to the ‘C:\’ drive of your SharePoint machine, and create a new folder. Let’s call this folder ‘SharePointFiles‘. Copy/Paste your downloaded exe in this folder. Now you should also see the executable: PrerequisiteInstaller.exe which will allow us to install the prerequisites. The next step is to create a PrerequisiteInstaller.Arguments.txt file in the SharePointFiles folder. This file will contain arguments, which will be used by the PrerequisiteInstaller executable. 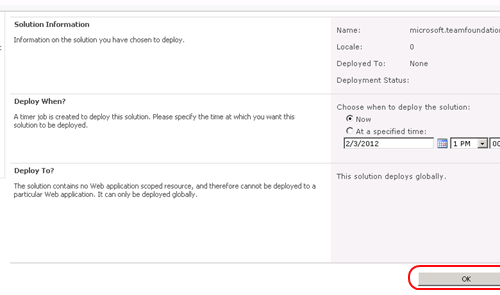 Each component required by the PrerequisiteInstaller will have its own argument. This argument has a name, and a location where the installer can be found. In our case, we will create a list of arguments for all required components combined with the location of that particular installer. Note: Because I’m on a 2008R2 machine, I use the arugment ‘IDFXR2’ instead of ‘IDFX’. Be sure to change this if you’re on a 2008 machine! The only step left is to install the prerequisites. Because the file PrerequisiteInstaller.Arguments.txt is in the same directory, the installer will use this file for its own arguments and thus install the prerequisites in an offline mode. 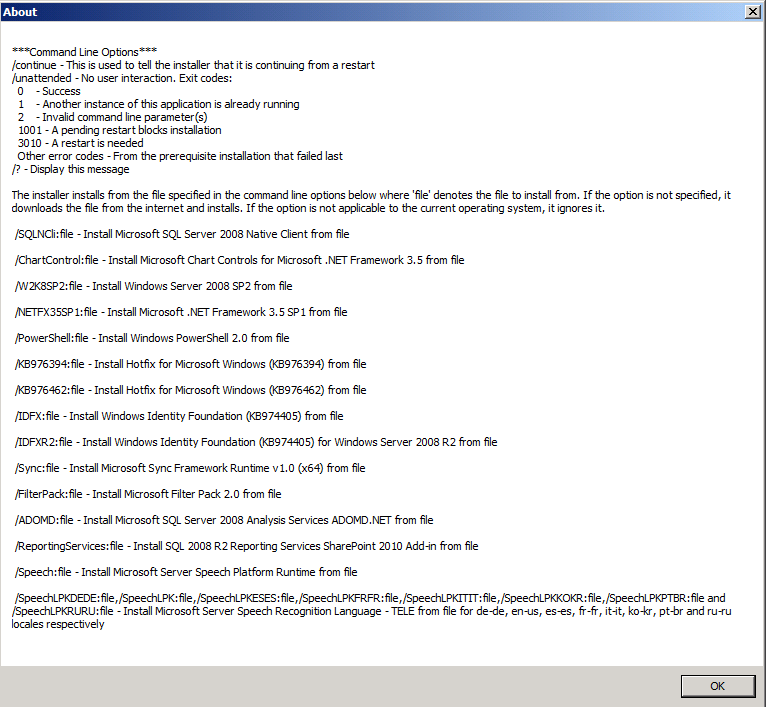 It can be possible (like it was in my case) that the installation using PrerequisiteInstaller.exe did not complete. In my case, it was because there were some arguments missing in my arguments file. When I was at a customer last week, I had a situation that SharePoint Foundation 2010 was installed as a local instance on the TFS application tier. The TFS extensions for SharePoint were already installed using the TFS installation. 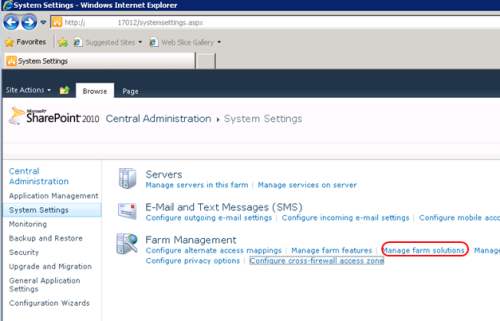 Now the SharePoint Foundation 2010 instance had to be changed to a farm installation. So the SharePoint Content and Configuration databases had to be located on a data tier (SQL Server 2008 R2). After the re-install of SharePoint Foundation 2010 in a farm mode, the TFS extensions for SharePoint had to be installed again. That’s correct, that TFS integration service asmx was not available anymore. The first thing I did was an un-install from the extensions (using the TFS installation media). Then I did a re-install of the extensions, but without any result. I hoped those steps could solve my problem, but they didn’t.. Time for the next step. To resolve the issue, you have to install the TFS extensions manually to the SharePoint solutions store, and then deploy them. To do this, you need the stsadm tool from SharePoint. That’s the command-line administration tool from SharePoint. You have to add 3 .wsp files to your SharePoint farm. 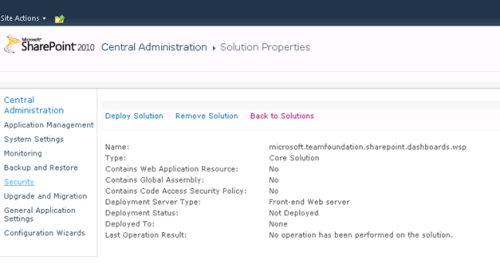 All you have to do now is grant access for your TFS instance to SharePoint using the TFS Administration console. That did the trick for me. Thanks for reading!